My apartment that I share with my boyfriend is tiny. We only have one locking door besides the front door (the bathroom door). The rest is sort of one large area, so I guess it's technically a studio apartment. We make do though, but it requires creativity. 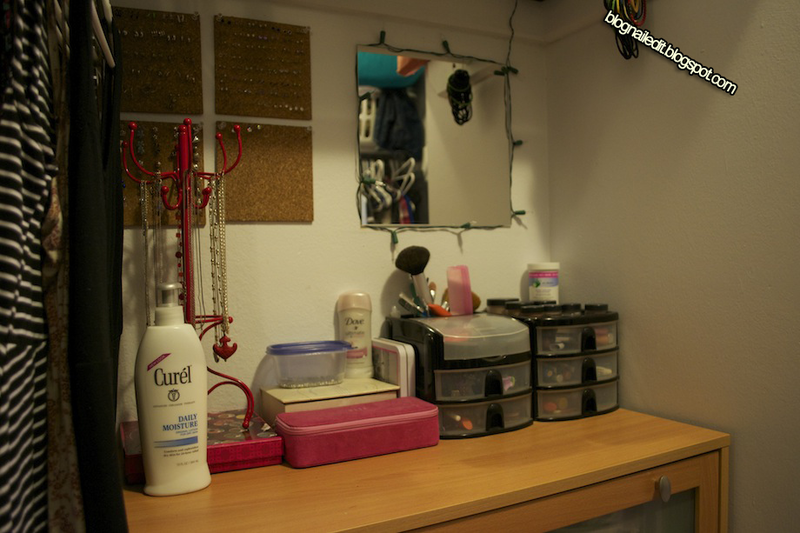 I'm not big into makeup, but I do like to have a place to do my morning routine. My solution to this is what I'm showing you today. Everything is on top of my dresser or slapped up on the wall behind the dresser. On top of the dresser I have everything I need. 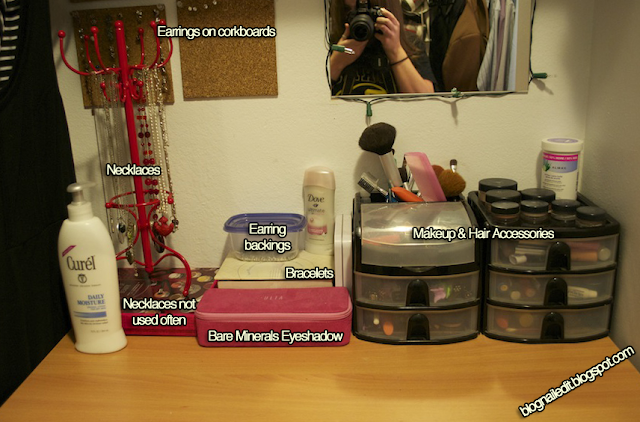 Makeup (all Bare Minerals), necklaces, unused necklaces, earring backings, bracelets, lotion and deodorant. This pretty much completes my routine. On the wall behind the dresser I attached four corkboards that I stick all of my stud earrings in. The backings are placed in a little tupperware. It's a pretty effective system, and lets me see all of the earrings I have. 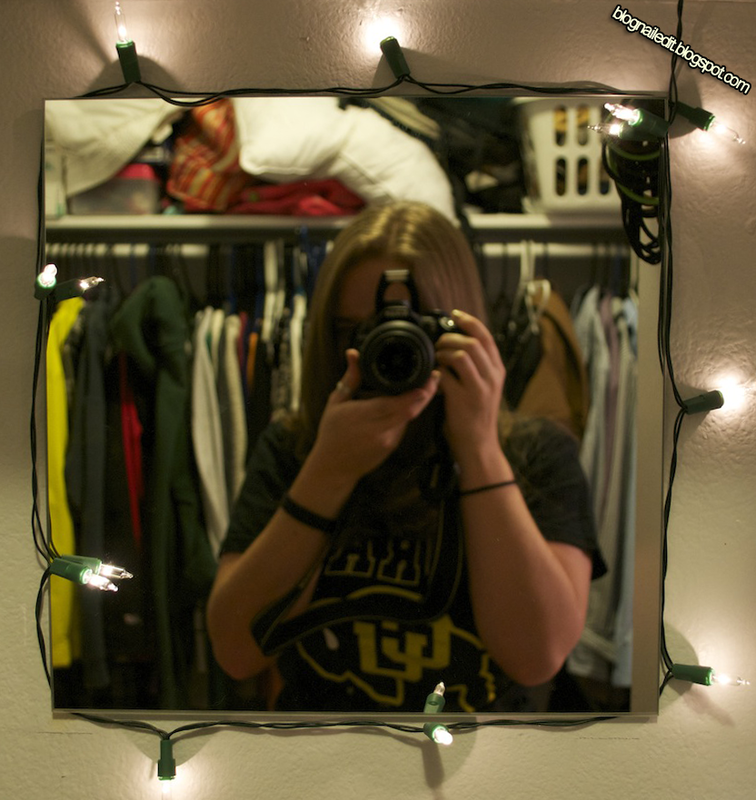 Also on the wall, I attached a mirror from Ikea. It's adhered with sticky strips that came with the four-pack of mirrors. The one thing about the location of my dresser is that it's dark, and directly under the bar that shirts and dresses are normally hung on. Leaning in to look at the mirror makes my face really dark, so putting on makeup can be rather obnoxious. I mean, I'm already exhausted enough, so squinting in the dark doesn't help. My solution was to get a small pack of battery-powered Christmas lights with a switch I can turn on and off. 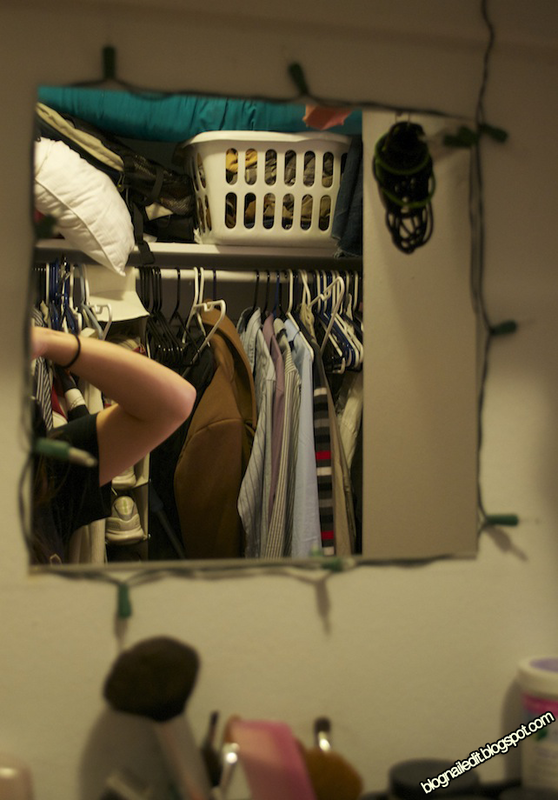 Did I mention there are no outlets in the wall of the closet? So now, when I lean in close, there's a great ring of light around my face, and my reflection is much brighter! The switch to turn the lights on and off is also really easy to get to. 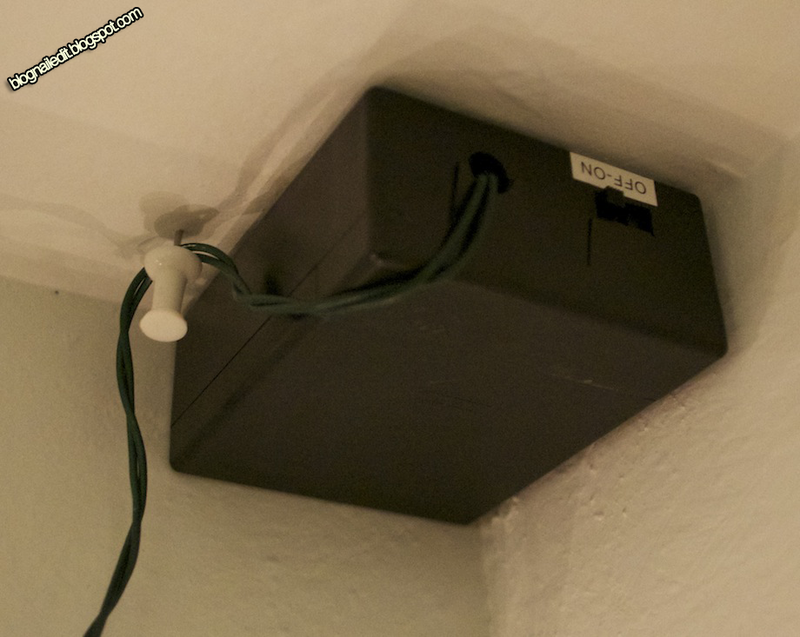 The battery box is also adhered to the ceiling of the wall the bar for clothing is attached on. It's a simple setup, but it makes life a hell of a lot easier! Interesting! 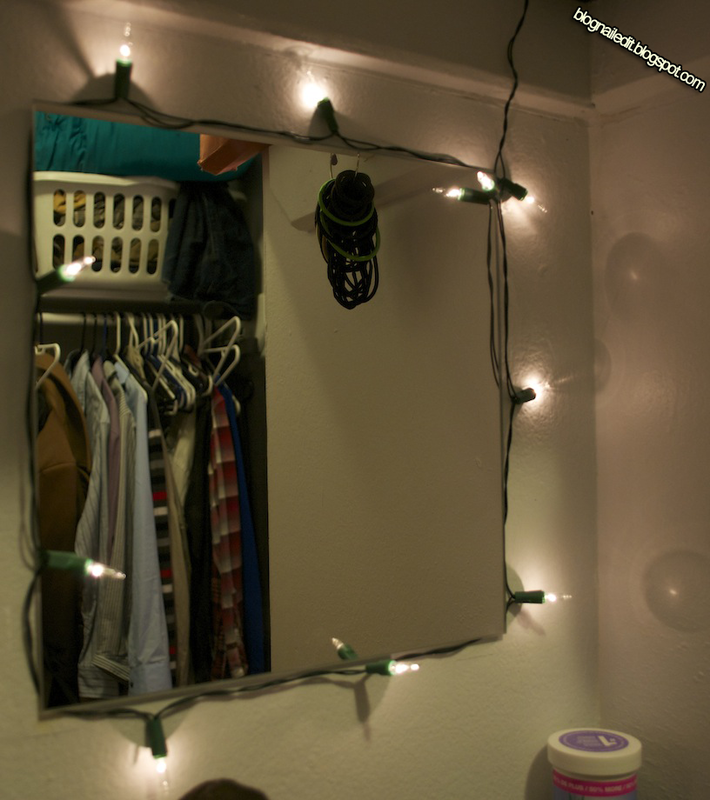 Love the lights around the mirror! I enjoy comments of all types! However, please do NOT promote your blog through the comments of my own. If you would like to contact me personally, please use the Contact and Disclosure page at the top of my blog. Thank you and enjoy! Like what you see? Share it with my easy sharing buttons, located on the left or bottom of your screen! All content created by Katy Parsons of Nailed It is licensed under a Creative Commons Attribution-NonCommercial-NoDerivs 3.0 Unported License. © 2014 Katy Parsons. Powered by Blogger.